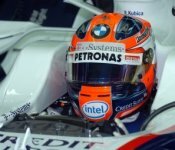 This weekend sees Robert Kubica return to the race track, where he survived the most serious accident of his career last year. A lot has changed since then. As BMW Motorsport Director Mario Theissen confirms, Robert has matured as a driver. Three podium finishes, one pole position and 32 points: the 2008 Formula One year has been very successful for Robert. The Pole has undoubtedly taken the next step up the career ladder in only his second complete season. "The most remarkable thing about Robert is how focussed he is," says Mario Theissen. "He puts racing above everything. At the end of 2005 it was a risk to take him on board as a test driver, despite his lack of Grand Prix experience. However, his rate of development has been high, right from the start. He quickly made the regular place his own. Last winter he took another big step forward." One thing remains the same: Robert has preserved his immense ambition, with which he aims to reach the top of motorsport's elite class. Theissen explains: "He gets extremely angry with himself if the existing potential is not converted into a corresponding number of points. After his three podium finishes in the first third of the season, he knows that he is ready to win a race. That is making him even stronger." However, Theissen warns against blowing the expectations of Robert and team-mate Nick Heidfeld out of all proportion. The German believes that talk of a World Championship title this season is too premature. "That would be unrealistic," says Theissen. "We have an ambitious schedule: we want to win our first race this year, and then compete for the World Championship as of 2009. Since taking over Sauber we have achieved all our objectives so far, and want to continue moving forward one step at a time."